Lantern slide showing Cork Hill trade card. Originally catalogued with the label 'M2 91' and 'Mason Optician Dame St, Dublin.' 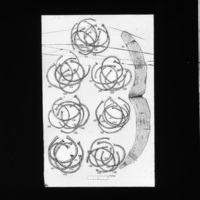 Slide features drawing of Sir Isaac Newton. 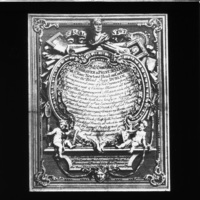 Lantern slide showing the frontispiece and title page of Thomas Ewing's 1771 edition of Shakespeare. Originally catalogued with the label 'M2 89.' 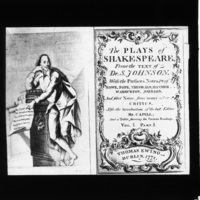 The slide features a full drawing of William Shakespeare. 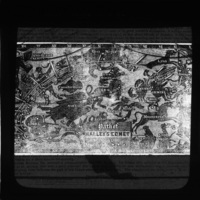 Lantern slide showing a frontipiece of Irish traveller. Originally catalogued with the label 'M2 87' and 'Mason Optician Dame St, Dublin.' The slide depicts three Irish traveller men handing a book to a woman. The slide is badly damaged. 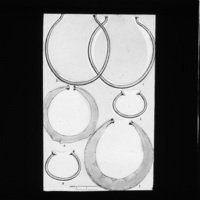 Lantern slide showing various gold objects in the National Museum of Ireland. 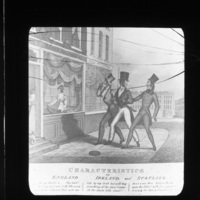 Originally catalogued with the label 'M2 85' and 'Mason Optician Dame St, Dublin.' The slide has been colored and is badly damaged. 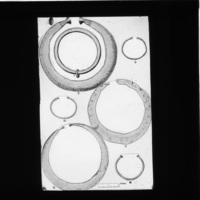 Lantern slide showing various gold objects in the National Museum of Ireland. 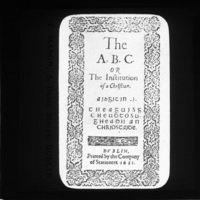 Originally catalogued with the label 'M2 84' and 'Mason Optician Dame St, Dublin.' The slide has been colored and is badly damaged. Lantern slide showing various gold objects in the National Museum of Ireland. Originally catalogued with the label 'M2 82' and 'Mason Optician Dame St, Dublin.' Showing seven gold lunulas with scale. The slide has been colored. 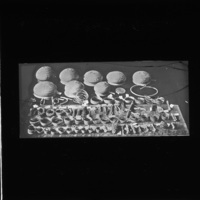 Lantern slide showing various gold objects in the National Museum of Ireland. 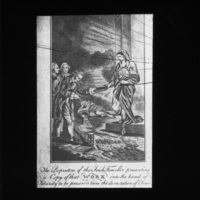 Originally catalogued with the label 'M2 83' and 'Mason Optician Dame St, Dublin.' Showing five gold lunulas with scale. The slide has been colored.